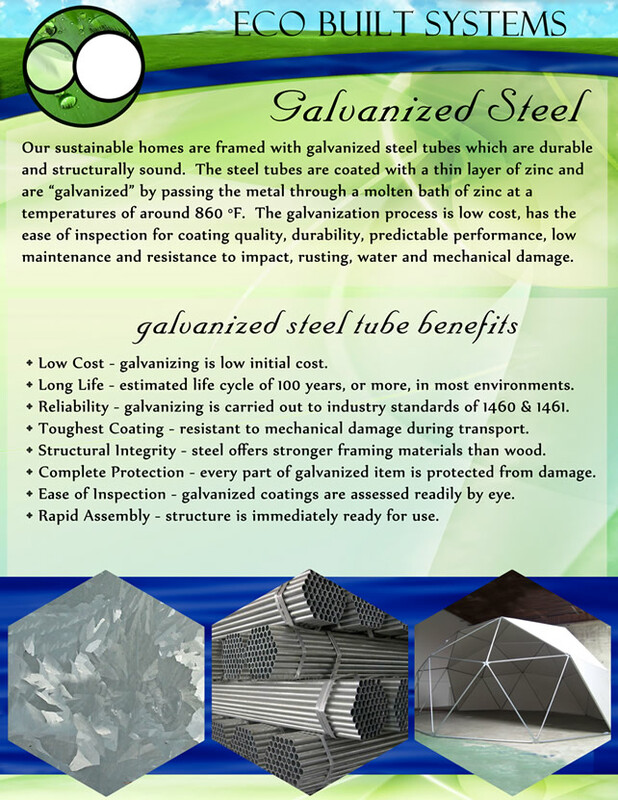 The galvanized steel tubes that we use in our sustainable homes are reputed for their durability and structural integrity. Galvanization is the process of passing zinc coated steel tubes through a molten bath of zinc at temperatures as high as eight hundred and sixty degrees Fahrenheit. Our galvanization process is not only economical but highly predictable. Galvanized steel tubes have a number of advantages. Firstly, galvanized steel tubes are economical as the process of galvanizing is low cost. Secondly, galvanized steel tubes are reputed for their long lives. The estimated life cycle of a galvanized steel tube is 100 years and is more in certain environments. Thirdly, galvanized steel tubes offer phenomenal reliability as the process of galvanizing is carried out in accordance to industry standards 1460 and 1461. Fourthly, galvanized steel tubes offer stiff resistance to mechanical damage due to their tough coating. Fifthly, the sheer strength of galvanized steel tubes make them exhibit superior structural integrity compared to traditional framing materials such as wood. Sixthly, every inch of galvanized steel tubes is protected from damage. Another benefit of galvanized steel tubes is that they can be easily inspected and assessed by eye without the need of complicated procedures and equipment. The last advantage of galvanized steel tubes is that they are often ready for use due to their ease of assembly. To help prevent spam, please answer the following question: * Which is darker: black or white?